One of the biggest problems with tampons isn’t the tampon itself; it’s the plastic applicator. Between a pad and a tampon, tampon would be the “greener” solution, especially if the applicator is made out of cardboard. However an important thing to consider is that most cotton produced in the world is conventionally produced with the use of synthetic pesticides and fertilizers. 43% of the world’s cotton is Genetically Modified – which means it was subjected to heavy pesticides. NatraCare makes organic cotton tampons with cardboard applicators. Pads are made with “super absorbent materials” that can hold up to 10X their weight. 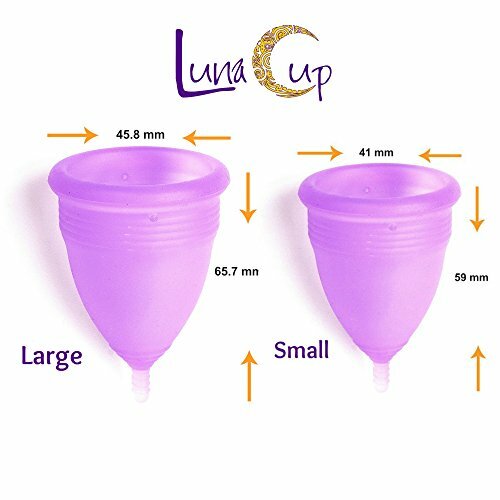 They also have plastic linings, which stay on the planet for a long, long time..
Tampon Alternatives: The Menstrual Cup or Sea Sponges. There are a few different companies that make them; The DivaCup, Mooncup, SckoonCup and the Keeper are the ones I’ve heard of. You place these inside the body where they collect blood, some up to 12 hours, and when you’re ready, you take them out, rinse and re-use. You can sanitize them by boiling them or keeping them in a vinegar solution before using them. You don’t want to introduce heavy chemicals and bleach into your body so I suggest not trying to clean it with chemicals. The cup will naturally stain with use. I personally do not find the menstrual cup comfortable but some women swear by it. This would be the GREENEST alternative to tampons or pads. You can also make your own reusable pads or you can purchase them from a variety of companies or individuals on Etsy.com. I highly recommend buying organic cotton whether you are making it yourself or buying it. Some companies that sell reusable pads are; Gladrags, Lunapads, SckoonCup, Etsy. The below site contains a number of other sites in it, some are active some are not. Also Pinterest has a number of posters and images on how to make reusable pads. *Amazon carries both organic cotton and wool flannel. I took a regular and an over night pad and traced them on a piece of cardboard, then I cut the wings and the outer layers off the pads and traced the filling for both. When I had the cardboard with the pattern, I cut my fabric out, using 3 layers of organic cotton flannel for the filling, I hand stitched the pad inside out until I got to the second wing. I flipped them inside out and sew the second wing right side out. They don’t look amazing, and I still use other pads for heavy days but I really do love using them. They stain, obviously, and they're not super easy to travel with - washing and hanging them in a hotel bathroom is not ideal, but for those days I have a stack of NatraCare pads which are plastic free, organic cotton, biodegradable and chlorine free. You can find them online at Amazon or at health stores. NatraCare also makes tampons with cardboard applicators. Newer PostThe First Day of the 2017 NPA Challenge!